The McPappy Racing Helping Hands hobby vise was designed to hold small parts, models, painting models, paper crafting, metal crafting, decorative crafting, hobby items, hold items for polishing, jewelry, circuit boards, engraving, wood burning, digital microscope, quilling, figurines / miniatures, soldering aid, fishing lures, art, kids crafts, watch repair, clock repair, task lighting, gluing parts together, etc. We offer single arm and dual arm versions. If you start with a single arm, you can purchase an upgrade kit to make it into a dual arm version later. The 2 main components that make this third hand tool awesome are the 3 jointed articulating friction arm and the mini vise. 1 knob completely releases all 3 joints including the twist on both ends. A thrust bearing under the know prevents anything from wearing out. The stainless steel construction prevents the balls and sockets from scratching. It should last a lifetime. Each end has the industry standard 1/4"-20 threads that lets you directly bolt on other things. 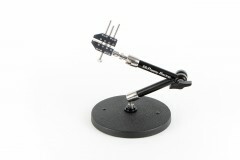 It acts like a desktop camera holder, desktop microphone mount, GoPro mount, or web cam holder. For less than $10 on Amazon, ebay or other stores, you can also pick up other items to bolt on like a magnifying glass, crab clamp to hold things like a Dremel, cell phone holder, tablet holder. For a more portable solution, you can even get mini tripod legs, or even a suction cup mount if the situation calls for mounting to glass, window, or a kitchen counter top or similar. This mini vise is the other component that makes this tool great. Featuring 2 polished tool steel rods, a custom turnbuckle with left and right-hand threads so it opens and closes twice as fast as a screw. The jaw opens to a generaous 1.25". Holes in the jaws for the included steel dowel pins allow you to hold odd shaped items. The steel dowel pins open to 2.15". V-slots were machined into the lower vise jaws to hold straight items like screws and rods in either direction. The hobby vise was made from 7075 aluminum for 3 reasons. It's lightweight so it won't get top heavy with an extended reach. It acts like a heat sink. When soldering, this will prevent excess solder from wicking up the wire. Lastly, it won't scratch other metals. Machinists refer to these types of vise jaws as "soft jaws". Click the button below to add the Helping Hands to your wish list.